Attending the Parelli Tournament here in Switzerland was a unique experience on lots of levels. A group of us from our local barn traveled north together by train- that was fun! The trains here are fantastic and given that heavy snow had already covered most of Europe, it was also safer as a big chunk of the Alps lay in our path. All during the weeks leading up to the Tournament I received numerous emails from friends- “it will be cold”, they warned, it will be very cold! And it was- but well worth the effort. The little town of Fehraltorf, was our destination and the arena was just a short walk from the train station. Attendance was very high, I would guess over a thousand people showed up despite the cold. Hot spiced Glü Wine and grilled Bratwurst kept us warm in the stands. Lots of horses, lots of demonstrations and plenty of “carrot sticks” for sale from the vendors. Even though the program was in German, it was an entertaining and informative show. It’s impressive seeing the commitment and passion in the Swiss Parelli instructors. They’ve taken Parelli training to a whole new level here; this with Pat himself nowhere near the place. It was obvious they spend a lot of time with their horses as the demonstrations were well done. I really enjoyed Senior Parelli instructor Adrian Heinen with his Iberian mule “Don Alfredo” who rode in the spade bit, he had the white mule in the two-rein and did a nice job. The finale was a skit by Parelli instructor Mike “Mikey” Wanzenried. He and his white Andalusian stallion “Pecas” put on a terrific performance. The theme was Mikey and Pecas arriving just in time to rescue a horse and rider in distress. The young rider is being “trained” by a typical German dressage instructor who is yelling and tying the horse’s head down with draw reins and such. Mikey and Pecas do an energetic liberty presentation around the German school master. Earlier in the video, we see Mikey working with a chestnut horse at liberty- this is the same horse he later pulls the “draw-reins” off in the finale show. I could go on but the video is much better- enjoy! 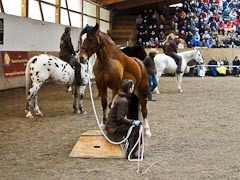 Comments for "Parelli Tournament Switzerland"
Cristina Corsi Van Roomen on December 27, 2010 Veramente speciale ed elegante quanto incredibile la contaminazione dell’universo che lega l’uomo ed il cavallo.